I had this nightmare once. And it almost came true last year. But luckily they were able to accommodate me. BUT that was last year. And what was the nightmare about, you ask? Well, it was about a waiter at Kohryu saying "Sorry, we can't do that anymore." Those six words relayed in Japanese would leave my heart skipping. But that was a nightmare. It couldn't really happen right? Wrong! It's now official, Kohryu will NEVER be that same Kohryu I remember from the late 90's. They have refused to make the one and only thing that kept me from ditching Kohryu after their first ownership change--Paiko Ramen R.I.P. And yes I did say "first" ownership change. Now it appears that they've had their second. After recently hearing that Kohryu had a grand opening (or grand re-opening) in January that had people lining up for 2+ hours (Is that really true? ), I thought I'd head down to my old hood and check out the newest version of my once-favorite-ramen-ya. I first blogged about Kohryu last July, and back then they were still similar to how the original one was. Even though the taste had changed, the overall feel had not and they were always eager to make the off-menu Paiko Ramen. But now, the only thing left is the name. The people working are different. The decorations are different. And heck, even the soap in the bathroom is different. I may never recover from this resentment, but I will try my hardest to fairly review the following food I ate. 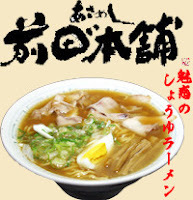 Kohyru-ramen (shoyu): So I settled on the Kohryu-ramen. A refreshing shoyu ramen with an overwhelming fried onion impression. It tasted like french onion soup with noodles. Not that that's bad, but it was not expected. The noodles were just your average ramen noodle probably made in some factory down south. The toppings (a hanjyuku egg, chashu, menma, raw negi, and charred negi) appropriately kept this ramen afloat. The hanjyuku egg was the most worthy part. Overall, I would say that this was last year's Lakers. With the hanjyuku egg being Kobe and everything else just there to complete the roster. It's definitely lacking some Pau! Gyoza: This gyoza did not look appetizing at all. It tasted fine with loads of garlic, but they still couldn't compare to how good they used to be. Age soba: Kohryu was never really a full-fledged ramen-ya, but from this day on I will consider it only as a Chinese Restaurant. This age soba was absolutely delicious. It's like pan-fried noodles. IF I ever go back to Kohryu, I will be ordering this and only this. In looking all over the box to find the shop name, this instant ramen is simply called Hakata Ramen Tonkotsu. Hmmm...it says tonkotsu on one side and ninniku (garlic) on the other. I'm a bit confused on why two boxes are stuck together. Oh wait. It says 替玉付 (kaedama tsuki). Wow, I've never heard of instant ramen including kaedama. Looks like I'm in for a big meal. The contents include two packs of thin Hakata-style noodles (obviously), fresh ginger, sesame seeds, dried green onions, garlic chips, and a pouch of フクチャンスープ. Fukuchan soup? Okay so that must be the shop that makes this ramen. What a beautiful-looking instant ramen. It's not only good-looking, it's an instant culinary delight. If this was served at most ramen-ya's in LA, people would never know the difference. This smooth, creamy tonkotsu soup is loaded with flavors that will leave you speechless. The mind-numbing combination of garlic chips and ginger just blows you away. I take pride in my instant ramen cooking, but all the credit goes to the creators for this one. I don't think I could've messed this up if I tried. These garlic chips are as good as potato chips. You can't eat just one. 2/15 ~ 2/18 Limited Time Only! My last stop on this weekend's ramen fair is Sumire at the Torrance Mitsuwa. If you recall, I just had their instant shoyu ramen last Monday and wasn't very impressed, but I'm sure things will be different this time around. Interestingly, the line at Santouka was still longer. I must say that there is a lot of MSG in this one. So if you aren't cool with it, consider this a warning. The layer of oil on top also keeps the soup scolding hot, so try not to slurp too fast. The miso flavor was outstanding, much better than the instant shoyu. It also reminded me of Keyaki. They both have that sweet and mildly spicy miso flavor that kills all other miso ramen in the states. The toppings (slightly dry chashu cubes, menma, moyashi, negi, and some onions) were good but minimal. I was even tempted to buy a pack of chashu from the market, but held back. The noodles were excellent and almost perfect. Sumire did not disappoint! Sumire will also be at the San Diego Mitsuwa from 2/22~ 2/25. I didn't plan on going to try this today, but on my way back from San Diego I passed by on the 405 and couldn't resist exiting (sorry ed I'll still meet you there on Sunday). Asahikawa shoyu has got to be one of my favorite types of ramen, mostly because the rich shoyu flavor blended with pork and fish and all the other ingredients guarantees to put a smile on my face. And Asameshi Maeda Honten was no exception! The very first thing I noticed was...wow a real bowl. Then I realized I had ticket #266 and that means someone has had to wash 265 bowls before mine...and this is only the first day! Man, I feel sorry for that person. Okay, on to the ramen. I almost felt like I was back in Japan traveling from Tokyo to Yokohama to Kawasaki all in one day to eat ramen. It's too bad we don't have a real ramen park over here, but I guess this is close enough. This ramen was incredibly good! If my stomach would have been able to take it, I would have eaten another bowl. Even with a burnt tongue, that soup was delicious (I think my tongue is really burnt now). The noodles could have been better, but they were just like Asahikawa makes them. The toppings (thinly sliced flavorful chashu, menma, egg, and negi) capped off a remarkably tasty ramen. You have to GO! Asameshi Maeda Honten will also be in Torrance from 2/22 ~ 2/25 and San Diego from 2/29 ~ 3/3 both at their respective Mitsuwa locations. If you miss the one in your town, I recommend traveling to the next closest. Have fun! It's not every day that a ramen fair hits Southern California. With that said, I gave up up one day's pay to make the hour and a half trip down to San Diego. It was definitely worth it just by the beautiful weather alone. A clear blue sky hovering over a crystal clear ocean with Catalina floating in the distance--a great way to start off this mini ramen trip. 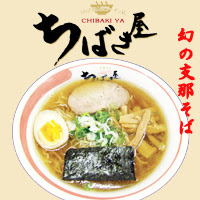 Chibakiya is known for their Shinasoba and claims to be very popular in Japan. After waiting in line for 10 minutes, I was getting a bit impatient. Hopefully it will all be worth it. There's nothing like a gourmet ramen served in a styrofoam bowl. At least they have proper spoons. This ramen looked delicious. I felt my excitement about to burst as I carried my tray to the table. Just seeing the pork fat floating in the soup was giving me goosebumps. And after the first sip...it was lip numbing good. Not bad, not great, just really good. I think my tastebuds have been used to being spoiled from my Japan trip. Anyway, I still liked it. The soup was hot (which was good) and I think I may have burned my tongue. The toppings (a hanjuku egg, menma, negi, nori, and a yummy piece of chashu) worked well together and left me wishing there was more. The thin, crimpy noodles were a tad overcooked, but there was plenty of them. There was also plenty of MSG which crept up on me during the drive home. Overall, it was good to see Chibakiya in southern cali and I would welcome them back anyday! By the way, I drove by some of the areas affected by last year's wildfires. It was crazy! I hope everyone affected is able to move on from them and rebuild their lives. The Sumire instant ramen comes in three flavors: shoyu, shio, and miso. The miso is their signature ramen, but I still opted to only buy the shoyu since I'm not much of a miso fan. As I write this though, I'm beginning to regret that I didn't buy the miso. Luckily for me, I'll be able to try the miso this weekend at the Mitsuwa Legendary Ramen Fair. Sweet! The contents include a pack of yellow noodles, menma, two pouches for the soup, and a picture of すみれや. This oily Sapporo-style soup was incredibly strong...and strange. This thick sardine flavored soup with just a dash of shoyu tasted like I was drinking fish blood. Very different, but I could get used to it...I think. The noodles were tastier than the soup. Their chewy texture probably saved the soup. I can't wait to taste the miso this weekend. Since experiencing the magic of Harukiya on Day 1 of my Tokyo trip, I was delighted to learn that I could take some of that magic home. There's nothing like a great tasting ramen to revive your senses after a long plane ride. The contents include いちばん スープ (#1 soup) and a packet of their original noodles. Don't worry, that soup looks much better once you add some water. I told you it looks better. My first thought: "Woah, this tastes exactly like the real stuff!" My second thought: "Damn, this stuff is incredible!" My third thought: Leave me alone I'm trying to eat this stuff. The noodles tasted remarkably fresh for being instant. They were alien-like, in the best way possible. Ever since I bought all these packs of instant ramen on my trip, I've been anxiously looking forward to this one. If you don't know about Taishoken, then you need to do your homework. I wasn't able to make it to Ikebukuro on my trip (even though I was only six or so stations away), but I'm looking forward to going on my next trip. The contents include a pouch of soup and an incredibly gorgeous packet of noodles. It might just be me, but those noodles look amazing. I've never seen anything like it. Wow. This is definitely instant ramen heaven! This light shoyu flavor has Tokyo written all over it and just looking at the pic below is making me drool. I feel like getting on the next plane to Ikebukuro in the morning. Yo bro, we should have went the opposite way to Ikebukuro instead of Ogikubo my first night there! These noodles were special. They must have been made with a mutated strain of kansui because they are crazy good! This instant ramen has one of the best boxes. Not only does the flaming wok capture your attention, but the all black background makes you wonder what's really inside. This could be interesting. The contents include a pack of crimpy noodles and two pouches of soup. I'm not afraid of the dark, but this dark soup somehow frightens me. How do they make it so black? Anyway, back to the review. Well, it's definitely not your typical ramen. The shoyu flavor was surprisingly mild and I really couldn't taste the squid. I expected more of a charred flavor, but looks can be deceiving. The noodles were incredible! 生ラーメン is the best! So now we come to something I didn't try on my Japan trip. And I think I might pass out soon from all this MSG. My head is pounding. If you see an unfinished post, then that's probably what happened. The contents include a light, elegant-looking pack of noodles, a packet of shoyu soup, and dried green onions. Sweet, another one with toppings! I love shoyu ramen, but I'm not so sure that I love this shoyu ramen. The soup was very strong and surprisingly thick for shoyu. Overall, it still had a good flavor. I would eat it again. These Hakata-style noodles were great. The best instant Hakata-style noodle I've ever had. No joke! Whew...it looks like I made it through the post without passing out. Here is another instant ramen based on a real ramen I tried during my Japan trip. Amazingly, like the others, this instant ramen tastes almost exactly like the real thing. They must have some sort of ramen cloning machine in Japan that automatically zaps the real thing into a box of instant bliss. I wouldn't be surprised if that were true. The contents include the noodles, a pouch of miso soup, a pouch of アブラ, and WHAT!...toppings? Okay it's not much, but look there's menma and goma included! Nice. I could drink this soup for days. I'm not much of a miso fan, but this soup is extraordinary--it contains apple juice. It's a sweet and spicy symphony that just dances on your tongue. I've been to Sapporo before, but I never tasted a soup like this. The menma and goma are a nice touch, but I do miss all those toppings from the original. The noodles were nice and chewy. I wish I had bought some more of this one. I thought about taking a month off from eating ramen, since I ate so much in Japan, but after several days the withdrawal was setting in and my love for ramen was yearning for some comfort. I needed to break open one of the instant ramen packs that I bought at the Shin-Yokohama Raumen Museum. This will be the first time I feature an instant ramen on this blog, I usually just leave the instant stuff to edjusted and alvin (because they both do such a great job), but I guess I can't be selfish and I should share these with all of you. In case you don't remember my encounter with the real Hachiya ramen, you can check it out here. At the time, I called it the best I've ever had, but that was before Jiraigen. Let's see how the instant stuff compares to the original. 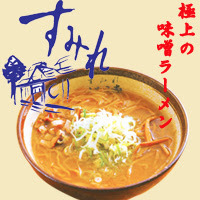 The contents include a packet of Asahikawa ramen soup and a delicious-looking pack of nama ramen. No toppings included, which is a shame, but I wouldn't want to eat chashu or menma stuffed in a little box anyway. It's probably better to not add any of my own toppings either because I wouldn't want to ruin the flavor Kato-san intended. Just a gloopy mess until you add water, but it still smells so good. Okay, so it wasn't exactly the real thing, but it still tasted better than most nama-ramen we can get over here. The soup had a really distinct fish essence that I don't remember the real thing having. But that charred lard flavor was amazingly still there. Mmmm...I'm glad I bought two packs! The noodles were very similar to the real thing. Oh man, I wish every ramen-ya in LA would use these noodles.